Receive a free copy of Prosper's amazing biography of courage and godly dedication to compassion in serving his war-torn Burundian countrymen. Founder of JRMD and the Iwacu Kazoza School & Orphanage project. "If you're going to Kill them, You Must Kill Us First"
This is the title of a book I wrote about a most incredible man, and he wants you to have a copy. During the 1993-94 ethnic wars in Burundi, East Africa, peacemaker Prosper Ndabishuriye and team members stood before the guns of government soldiers and Hutu militias to protect team members about to be killed by soldiers of an opposing ethnic group. 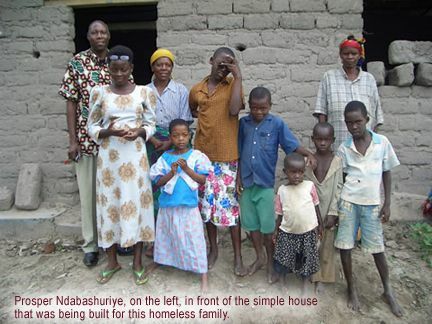 They were on a mission of peace, reconciling Hutus and Tutsis through the joint rebuilding of destroyed homes. I have always been deeply moved by Prosper's courage and compassion which is selfless act, as a long-time friend, I decided to write and publish a book on his life story titled " If You're Going to Kill Them, You Must Kill Us First"--words spoken to soldiers ready to assassinate those of the opposing ethnic group. I would like to send a free copy to those of you who make at least a $50 donation through the tax-deductible Global Giving web site. Once you donate, just email me with your name and address and I'll get a copy in the mail. You can also just purchase the book on amazon of this amazing story for $12.95. Those of you who've met Prosper will appreciate the greater detail on his enduring ministry which continues to this day with a school and orphanage project.